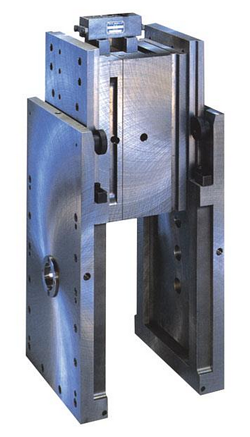 This type of mold includes a standard injection molding frame that utilizes a number of inserts in order to define the shape of the internal cavity (and thus the eventual part). MUD inserts can be manufactured via CNC machine or an Electric Discharge Machine (EDM) depending on the material requirements of the mold inserts themselves. If you are injection molding with a plastic that has a very high molding temperature, if you are executing an unusually high number of cycles, or if you are working with parts that have very complicated or fine surfaces, you may need to use inserts with more robust material properties. Depending on the material required, CNC machines may not be able to make the required cuts. An EDM machine can typically accomplish the cuts when a CNC machine is not sufficient. Advantages: The large upside to using Master Unit Die Molds is that it lowers total cost and turnaround time for prototype revisions. The inserts can be easily removed, redesigned, and re-inserted while leaving the larger part of the tool in the injection mold machine. For this reason, if there is a requirement for significant debugging and/or adjustment to the injection molded part then the MUD inserts are a great option. Disadvantages: There are disadvantages to using injection molding as a methodology for rapid prototype revisions in general. Note that such a statement is not really a criticism of MUD Molds per say but rather an endorsement (in those cases where it is possible) to rapid prototype via iterative 3D printing and/or CNC machine cuts. Once such a course of action has been taken, however, it may still make sense to prototype test the injection molding process itself as there are always unexpected eventualities that perhaps were not discovered in, for example, 3D printing. Notes: The use of “slides” or “cams” is not unusual if the part design includes an undercut that requires molding. Slides and cams are moving parts within the mold that allow or restrict access to particular areas within the tooling (and thus facilitate the desired shape of the part). The use of slides or cams can facilitate ejection of certain areas of plastic that might otherwise be trapped in the tooling. Solid aluminum tooling is often a final deliverable for a project. In other cases, aluminum tools are designed such that potential changes can still be made during the development process (e.g. if prototype iterations are to be made during injection molding). In general, aluminum tools are easier to machine than steel tooling and so iterative design changes are typically less burdensome. Advantages: Aluminum is a very strong conductor of heat (it heats up and cools down very quickly). The fact that it cools down so quickly is what makes it particularly useful for injection molding (a cyclical process). Quicker cooling generally means more cycles in a given amount of time and therefore, faster production. Note: Production time isn’t typically the highest priority when prototyping parts so this may or may not be a relevant issue. In any case, it is good to understand and may help to inform decisions when it comes to full scale injection molded manufacturing. Another advantage of aluminum tooling is that it could potentially improve the flow of material through the mold. Better flow properties can be a significant advantage because you are decreasing the risk of defective parts that ultimately cost you money. Many injection molding defects can be avoided by working with experienced engineers that utilize moldflow software like Solidworks Plastics (read more here). You can read about the ten most common injection molding defects here. Additionally, here is a quick video of an injection mold cycle where the molten plastic is flowing from the gate (point of entry) through the entire part. Disadvantages: Aluminum tooling cannot replicate certain prototypes perfectly - particularly those requiring special finishes. You cannot polish aluminum as well as steel, so if really high-gloss surfaces are required, steel is usually a better choice. Note, you can still get a really good polish on aluminum, just not as good as steel. Additionally of note, polished finishes are typically not the focus during prototype processes. If this is not an important consideration for this phase then aluminum is not necessarily a poor choice. That said, the ability to produce a finished surface directly from the mold is something to consider when moving towards production and the selection of a production tool. A second disadvantage to aluminum tooling is that it is less robust than a steel tool. Although a good aluminum tool can produce from one hundred to even one hundred thousand parts without degradation, when comparing apples-to-apples, steel is typically much more robust. The lifespan of an aluminum tool depends on the molding temperature, the number of cycles, and the intricacies of the part itself. An additional consideration with aluminum is the particular alloy being used. Some of the aluminum alloys in the 7000 series, for example Aluminum 7075-T6, are very robust - and are even comparable to steel in some material properties. Steel tools are typically used for full scale production (high volume manufacturing) rather than as a prototyping mold. They are generally considered an upgrade over MUD or aluminum tooling. When working on a steel tool the designer is typically focusing on production issues rather than part design. Large concerns might include mold flow properties, gate location, location and number of vents for trapped air, cycle time, and the material properties of the particular plastic being used. Advantages: Steel molds have very long lifespans and it is for this reason that they are most often used in production. While steel is less thermally conductive than aluminum, it is much more robust as a general rule. Typical injection mold temperatures, even with short cycle time, will not have an adverse affect on the tool itself. Disadvantages: Steel tools are typically extremely complex and precise. They are either used for production or are one step away from it and so the tolerance for errors is very small. Mistakes in production are very costly and so it is incumbent on the design and development team to get everything exactly right in the pre-production iterative process. There are a vast number of considerations to mull over when evaluating the right material and design for prototype molds. Three common options are the Master Unit Die (MUD), aluminum tooling, and steel tooling. Each have their advantages with regard to cost, efficiency, quality, rapid prototype capability, iterative design capability, scale, and finishing requirements. We evaluate each project for the correct combination of quality, price, and suitable use. If you have questions please don’t hesitate to contact our team for their expertise.